Lake County is located in the northern part of Illinois and is west of Lake Michigan. Neighboring counties include Cook County to the south and McHenry County to the west. According to Wikipedia, as of the 2010 census the county had a population of 703,462, which makes it the third largest county in Illinois. Lake County contains a variety of cities, towns, villages and townships. As well, the county has a variety of unincorporated areas. Among the cities are Highland Park, Highwood, Lake Forest, North Chicago and Waukegan. There are many villages. 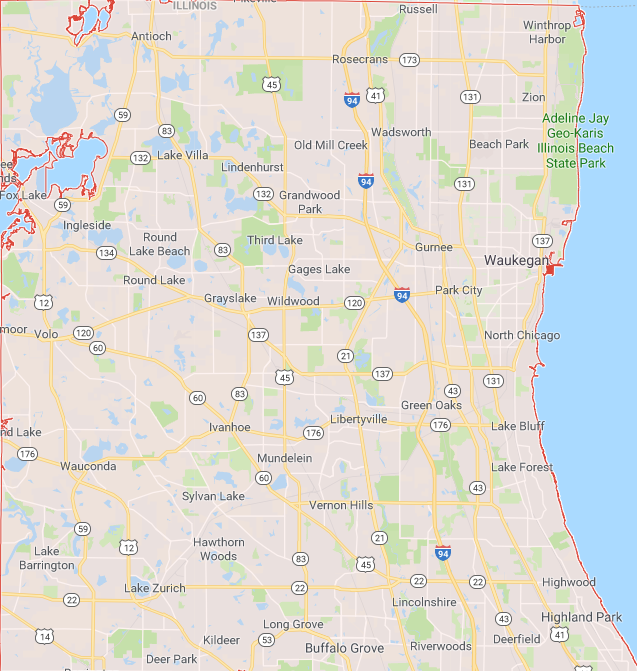 Some of these villages include Antioch, Barrington, Deerfield, Fox Lake, Grayslake, Gurnee, Lake Bluff, Libertyville, Round Lake, Vernon Hills, and Wheeling. Other major roadways are numerous. Given these roadways and the associated traffic they carry, substantial numbers of traffic accidents occur on a regular basis. This Lake County Car Accident Lawyer Blog site highlights and summarizes a variety of car accidents and vehicle accidents that occur in the county. These accidents involve both accidents involving cars, as well as car-truck accidents, SUV accidents and truck accidents. Other vehicle accidents, such as those involving pedestrians, bicyclists, and motorcyclists are also summarized. As well, this site discusses other traffic safety issues and topics relevant to vehicle accident injuries. It also discusses personal injury lawsuits and wrongful death lawsuits, as well as other legal issues regarding these crashes.